Choose one Component from Domain 2: Classroom Environment, for in-depth study for this week. Develop a narrative that will prove that you know “HOW” to accomplish the criteria contained in the Distinguished or Proficient boxes of the rubric. In your narrative: Combine the Relevant Information from page 1 with the Elements next to the bulleted points on page 3. Accomplish the criteria in the Rubric on page 3. Feel free to use language from the Possible Music Examples found on page 4. Rehearsals for three different ensembles occur in my band room: Symphonic Band (10th Grade,30 wind students + 3-10 percussionists), Jazz Collective (top auditioned 9-12 jazz band, 20 students), and Jazz Studio (second 9-12 jazz band, 20+ students). I rehearse the Symphonic Band and Jazz Collective, while my colleague rehearses Jazz Studio in my band room and Wind Symphony (11-12th grade concert band, 41 wind players + 3-10 percussionists) in his band room. Rehearsals for Symphonic Band and Wind Symphony occur simultaneously during the first period of the day. This year, percussion students meet as a studio with our percussion coordinator. 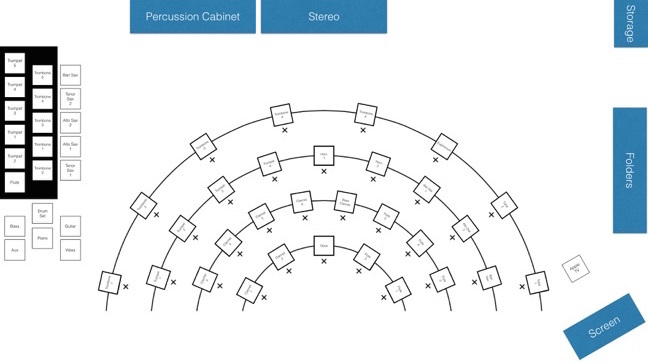 We have 14 percussion students in grades 10-12. They will cycle through concert band rehearsals, percussion ensemble rehearsals, and individual or small group lessons depending on the needs that the literature for the various ensembles. Rehearsals for Jazz Collective occur on Monday and Thursday mornings before school and Tuesday evenings. Rehearsals for Jazz Studio occur on Tuesday and Friday mornings before school. A bus is available to transport the 9th grade students in either jazz band to their building after morning rehearsals. Because of the fluid nature of the students and equipment in the band rooms, students are responsible for their own equipment. The basic set up of the concert and jazz band chairs and stands as diagrammed above is maintained. When students enter the rehearsal space, they are responsible for ensuring they and their equipment are in the proper location for the start of rehearsal. The students have ample space to store instruments, music, and other equipment in their lockers or folder cabinets. With the technology available in our rooms, I am able to display a Keynote presentation wirelessly from my iPhone, iPad, or MacBook Pro through the AppleTV and projector in the front corner of the room. At the beginning of every rehearsal, expectations and a schedule are displayed on the screen. I can also wirelessly stream audio through our Airport Express, located with our mixing board and powered speakers near the back of the room. I can control any streamed audio or video from any device from anywhere in the rehearsal space, freeing me to move in and amongst the students. We use FileMaker and Google Sheets to keep track of our instrument inventory, music library, and student locker information. By integrating this information with a Charms Office subscription, students and parents also have access to the instruments, music, and padlocks checked out to them. We own over 120 different wind instruments, two full sets of concert percussion instruments, and a myriad of electronics. Our music library consists of over 820 concert band titles and over 760 jazz band titles, all shared between the two high schools in our district. Our organization of the physical space puts us in between the proficient and distinguished categories of Component 2e. Our rehearsal setting is safe, and music learning is accessible to all students. There are students utilizing the performing arts wing throughout the day for individual and small group practice in addition to ensemble rehearsals. We make effective use of physical resources, including instructional technology. Our students assist by adapting the environment to advance ensemble music learning. Our rehearsal spaces can remain setup with equipment and technology so students can arrive and immediately begin making music.